Thinly sliced potatoes infused in a roasted garlic and caramelized onion cream sauce then topped with Asiago cheese and baked until tender ! Potatoes make me happy … potatoes with cheese make my heart sing … but potatoes with cheese AND caramelized onions AND roasted garlic make me ESTATIC ! This potato recipe is from the infamous Jamie Oliver. If you’ve ever followed him then you know how passionate he is about eating real, locally sourced, fresh food. He’s into rustic recipes with minimal work and few ingredients. 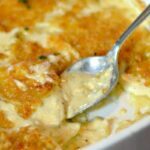 So Gratin Dauphinoise are the French version of scalloped potatoes from the Dauphiné region in south-east France. 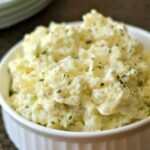 In its true form, it is a side dish is made without cheese. The starch from the potatoes, along with the cream, gives the dish its cheesy taste and the roasted garlic and onions infuse their flavors into the potatoes while being baked. However, we are in America, so we added a bit of cheese, but not cheddar and certainly not any prepackaged stuff. No, this recipe calls for Asiago cheese (or Parmesan). 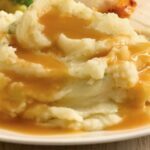 It is light, it is nutty, it adds just the right amount of cheese flavor without it becoming a typical heavy scalloped potato dish. These are seriously the best damn potatoes I’ve EVER eaten! 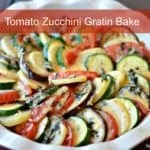 It shows once again how spectacular a recipe can turn out with very few, quality ingredients. The roasted garlic by itself gives such a deep roasted comforting flavor to these potatoes but then the addition of the caramelized onions just shoots it off the chart! Give yourself a little time to make this dish. The garlic needs to roast ahead of time and the onions can take up to an hour to get the deep caramelized flavor you want. This of course can be done ahead of time, and is suggested. Trim the head off of a bulb of garlic, so that the cloves are exposed (just turn the garlic on it’s side and remove the loose outer paper and cut the entire head by about 1/8″). Drizzle a little olive oil over the exposed garlic cloves. Wrap the garlic in foil and bake in the oven for 45-60 minutes checking it every so often to be sure it doesn’t burn. The end result will be soft, mushy garlic with a light to medium, golden brown coloring. Peel, halve, and thinly slice two medium yellow onions. Heat 2-3 Tbsp. olive oil in a large skillet over medium heat. Add the onions and stir. Season with salt and pepper. Turn the heat to low and watch to make sure they are sizzling but not cooking too fast. Adding 1 tsp of sugar will help the onions caramelize. Stir onions every 10 minutes or so to prevent burning. It will take approximately 1 hour to get a good, caramelized color and flavor, so be patient. If the onions start to stick, add some more oil, water or wine. Scrub and dry the potatoes. Thinly slice them using a mandolin. Place the potatoes in a 12″ cast iron skillet or oven proof pan on the stove. Add the roasted garlic, onions, thyme, bay leaves, ½ cup Asiago, heavy cream, salt, and pepper. Stir to ensure all the potatoes are covered and then spread out evenly in the skillet. Add in hot water and simmer on medium heat for about 5 minutes, until potatoes begin to get tender. Sprinkle in the remaining Asiago cheese and bake in the oven, uncovered for 15-20 minutes, or until potatoes are golden and tender.